What are you served for dinner while in the company of a lecherous reverend, an aging beauty queen, a gay lottery presenter, a guru, a shrink, a few reporters, and an odd assortment of South African parodies? Why, dinner of course! The rest is just dessert! 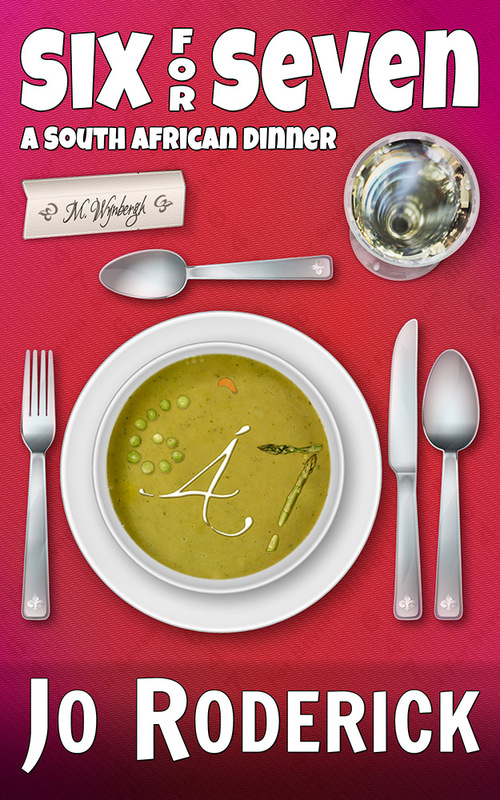 This novel takes a quirky look at South Africa, its inhabitants, and the comedy that is politics. This is what some real South Africans are like. Some you may like, and they will be back in their own book series. Do join us! Dinner is served, settle in, and get to know everyone at the table. If you enjoy this novel, you may want to follow the characters, and read 'The Scandari Saga - Aeonosphere'. * Paperback currently out of print. Read 50% of this Book for FREE NOW. What are you served for dinner while in the company of a lecherous reverend, an aging beauty queen, a gay lottery presenter, a guru, a shrink, a few reporters, and an odd assortment of South African parodies? Why, dinner of course! The rest is just dessert! 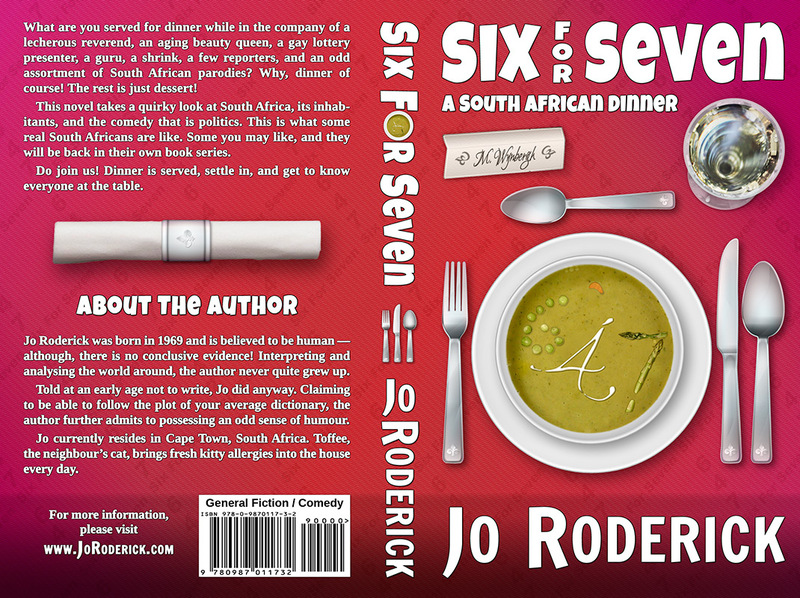 Six For Seven takes a quirky look at South Africa, its inhabitants, and the comedy that is politics. This is what some real South Africans are like. Some you may like, and they will be back in their own book series. Do join us! Dinner is served, settle in, and get to know everyone at the table. Note: If you enjoy this novel, you may want to follow the characters, and read The Scandari Saga: Aeonosphere. The Wynberghs are a well-to-do family. Rachel loves to socialise and throw fund-raisers, while her husband, Mervin loves to avoid them. Tonight, you will meet their guests. Tom Scandari and Annie Wynbergh have a long-standing friendship that could blossom at any minute. Annie’s parents are determined to see her married and the pressure is on. This couple’s story continues into the series, ‘The Scandari Saga’, where Tom discovers the ‘Aeonosphere’ and travels through time. Leticia and her husband Bingo are old friends of the family and have a marriage of convenience. Perhaps it is time they re-evaluated their relationship. The Reverend has ulterior motives, and he arrives with a plan. A fund-raiser is an excellent way to fill the coffers. The Guru has a few moves up his robe that leave Leticia panting. Can the socialite resist his magical charm or will she succumb to his poetic tongue? Katherine and Ewyn tell an amusing tale involving a bloody axe. They both poke fun at each other and Katherine’s children, the monkeys. Will Kathy and Mary venture beyond holding hands and go on a first date? Will Gareth’s head ever stop spinning like the balls of the lottery? Will Bingo hit the gay jackpot? It’s just a day in the diary of typical South African … or is it? A Fabulous South African Dinner Party! 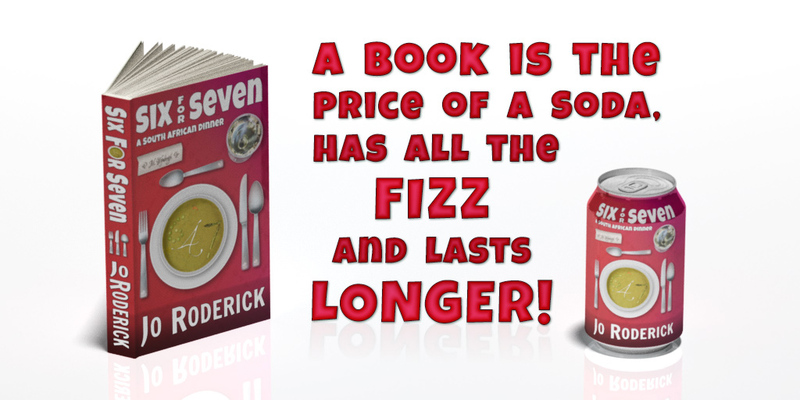 I thoroughly enjoyed reading Six for Seven. It’s a fantastic book, very cleverly written and very very witty. 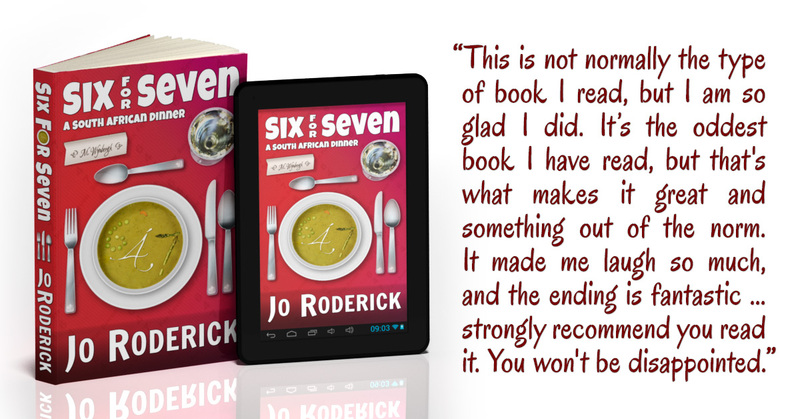 The book is based on a South African dinner party with some very interesting and complex characters. Each chapter is a different dinner guests POV giving us insight into their lives and their opinions of all the other guests. The story was quite political in places with conversations about police corruption and crime and although I have no interest in politics I have to say I found it fascinating and entertaining, detailing what life is like South Africa. There are a lot of ‘happenings’ with the characters, some come as couples and some are single and the great thing about this book is that you think you have got to know a certain character and then something happens with them or between them further in the book and you realise that they are not who you think they are. The ending is fantastic with newspaper clippings of what happens to each character once they have left the dinner party, whether it’s just after or days/weeks/months ahead. Brilliant just brilliant! A most unusual and highly enjoyable read. Really enjoyed this. An unusual book, for certain, and next to impossible to characterise, but a lot of fun regardless. A variety of figures sit down at the dinner table and one by one we enter their worlds and perch inside their minds as they parry the rapier-thrusts of repartee and try to guide the conversation where they want it to go. In less skilled hands, the gentle digs and the verbal dexterity might get tiresome, but because we have a chance to see inside these characters and understand what’s going on underneath the rhetoric, it retains an enjoyable tension to the end. The characters themselves, for all their mutual participation in the kind of evening Oscar Wilde would have enjoyed, are varied and (with one notable exception) immensely likable; the exception is important: you don’t want to like everyone. This is probably one of the oddest books I’ll read this year, but I suspect it will be one of the better ones, too. 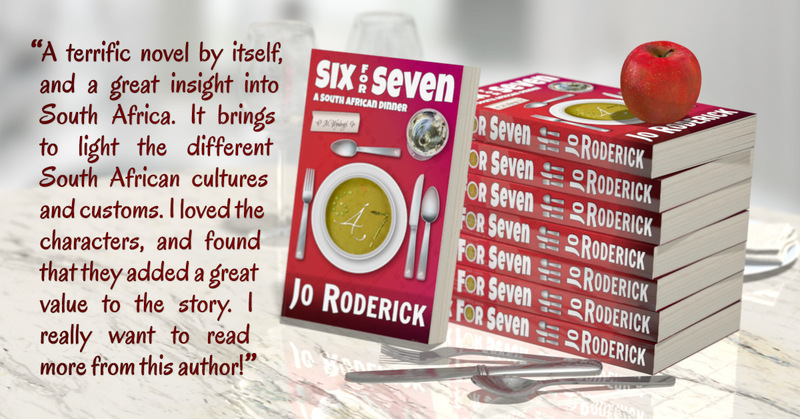 Click Here to Read More Six For Seven Reviews. Click Here to View More Press Kit Images.